Beware, if you are planning on spending your holidays in France, you should know that the French government is about to launch a new ‘Radar Zone’ concept which promises to be more stringent than ever. At present, the 1686 fixed radars which are placed strategically around France are announced 400 m before you get to them. Unlike in England, the boxes are grey instead of bright yellow but they are still easy to recognise from a distance. The French government is about to change the game by creating a system similar to the one currently in place in the UK. The ‘radar zones’ will no longer be as precise, instead a little more guess work will be involved as to where the evil grey boxes actually are. The plan, in theory, is that this will force drivers to slow down for longer periods of time. What does it mean in practice? A road sign will tell you when you are about to enter the ‘Zone’. This zone will cover 2km within which there will be one or more radars. So, if you decide to increase your speed after the first radar, do so at your own risk, for you may be caught by the second one. There will also be a zero tolerance level in place. Each time you are caught speeding, you will be charged 68 euros and will receive one point off your driving licence. I hate to say this but it seems rather cheap compared to what we normally pay in the UK. I think that the last time my husband was caught speeding (34 miles per hour instead of 30 in a tunnel leading to the Isle of Dogs in London he was charged £120 and got a hefty 3 points off his licence. 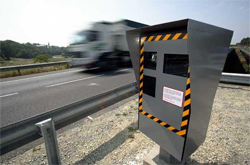 It is also worth pointing out that an additional 800 radars will be dotted around France between now and 2012 and that the ‘gendarmerie’ will no longer be requested to signal the mobile radars that they regularly operate. The regional prefects have been requested to present the government with a list of areas which are more prone to accidents than others and these areas will in return be equipped with more radars. 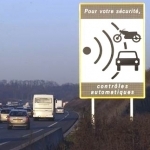 The government claims that this will help reduce the number of deaths on French roads. The scheme was started over 10 years ago but its implementation is taking rather longer than expected, despite the fact that all the political parties are keen to see it completed as quickly as possible. So be careful driving down the motorways and the A roads in France. Be aware that gendarmes have the power to make you pay on the spot fines. Be vigilant, slow down and keep safe.